The Lion returns to Sydney on Saturday stalking “another kill” at Royal Randwick, but this time there’s no sneaking under anybody’s guard. Michelle Fleming’s promising four-year-year-old (Arlington x Lion Belle) gelding was a $26 outsider when he came from near last to win a TAB Rosehill Gardens Highway in January. But the potential of the Tamworth trained flyer is now well exposed with three career wins and an impressive recent barrier trial to prime him for a TAB $60.000, 1100m episode at headquarters. The Lion won’t be a “roaring” favourite but he’ll be among the popular picks, ideally placed in a Class 3 with 56.5 kg and barrier one for Michelle’s stable rider Chris O’Brien. 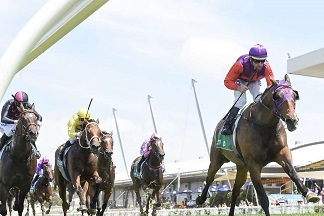 O’Brien rode him cold from near last to win at Rosehill Gardens and he was on The Lion’s back again when he was unextended winning a Muswellbrook Open trial on 30th May in smart time. The Lion easily won a TAB Highway at Rosehill in January. Credit: Bradley Photos. Is The Lion ready to roar? “He sure is,” Michelle bubbled. “I’m really excited. His trial was super, we took him for a breeze on Tuesday and he’s never worked better. “And if the track stays heavy all the better. He won on a soft seven at Scone and he lumped 61kg. “He doesn’t have to get back as far as he did at Rosehill either. Depending on the tempo, he can race closer and Chris will work that out but you know this is just my second trip to Sydney with a horse. “I didn’t think I be there with a horse the first time and we won. It was amazing. Not only that, I had my photo taken with Winx, a once in a lifetime experience. Meanwhile, Clint Lundholm returns with consistent Larlarbrook who struck one of the strongest Highway episodes two weeks ago when third to Danny Williams’ Group mare She Knows who carried 62.5 kg and is destined for much bigger occasions. Larlabrook will be fitter for the run after time off and laser treatment to rectify respiratory problems. Williams, a prolific series winner has accepted with Arrondissement and Rumba Queen with the latter leading throughout to win at Goulburn on Tuesday. If Williams elects the quick back-up, Rumba Queen will carry a two kilo penalty. Royal Randwick at present is rated a heavy eight after consistent rain.